Gladiator 77" 4 Shelf Tool-Free Rack Only $149.99! Down From Up To $299.99! You are here: Home / Great Deals / Gladiator 77″ 4 Shelf Tool-Free Rack Only $149.99! Down From Up To $299.99! Gladiator 77″ 4 Shelf Tool-Free Rack Only $149.99! Down From Up To $299.99! 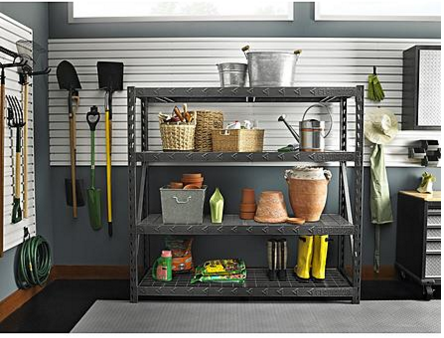 Sears has this Gladiator 77″ 4 Shelf Tool-Free Rack on sale for $149.99 (Reg. $29.99)! The 77″ 4-shelf tool-free rack 8000-lb capacity has steel shelves and a heavy-duty welded frame and requires no tools for assembly. A layer of protective coating protects the metal’s hammered granite finish. Assembly is required, but Gladiator’s exclusive tool-free design makes that easy.